But in fact, heart attacks, strokes, high blood pressure, asthma attacks and premature death – in addition to cancer – all are linked to wood smoke pollution. It’s a finding that poses a vexing dilemma for poor and rural communities around the Northwest where wood is a cheap or even free source of heat. And in Tacoma, where the air is so dirty it violates the Clean Air Act, authorities are gearing up for what promises to be an arduous and expensive campaign over the better part of a decade to clean up wood smoke pollution. It’s an effort that already has some residents chafing at government interference, and one that will set the stage for how other Northwest communities are treated when they bump up against tightened federal pollution standards. In Tacoma and many towns across the Northwest, wood smoke is a prime culprit in driving spikes of sooty, toxic air pollution that leave some residents – particularly asthmatics, kids and the elderly – gasping for breath. It’s especially bad during sunny, cold stretches like those we’ve seen in recent weeks, because atmospheric conditions trap the pollution close to the ground. In Washington, the state Ecology Department estimates that sooty pollution from sources including wood smoke and diesel exhaust contributes to 1,100 deaths and $190 million in health costs annually. Ecology says a conservative estimate of the annual number of deaths attributable to soot pollution in Pierce County alone is 140. The toll in everyday suffering is less easily quantified. But Nancy Gregory, an asthma sufferer who lives southeast of Tacoma near Spanaway, is typical. She says she dreads having to go outside when the winter sky turns blue and air-cleansing rains stop. “When I walk out to the mailbox, I come back in and sometimes I’m wheezing and I have to go to my inhalers. It makes it hard for me to breathe,” said Gregory, 70. For her husband Bryan, 73, it’s even worse. He has chronic obstructive pulmonary disease and must breathe from an oxygen tank most of the time. When winter weather turns nice they try to stay inside – but eventually they have to buy groceries and go to doctor’s appointments. 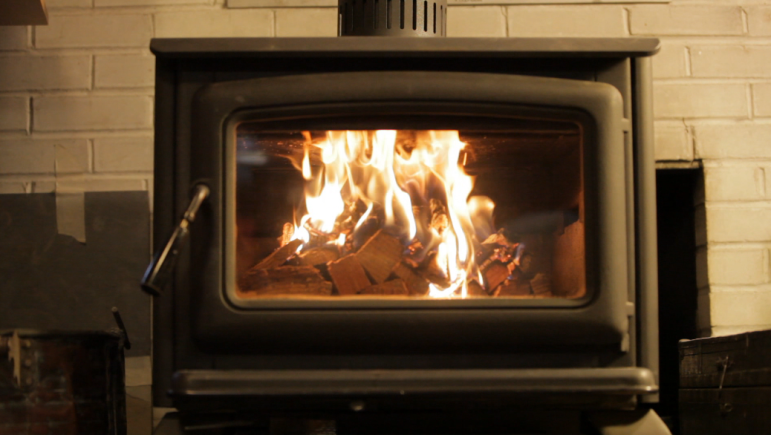 Restricting use of wood stoves that heat so many homes across the Northwest is a difficult proposition, though, because many people can get wood for cheap or for free, and using a wood stove can greatly reduce electricity and natural-gas bills that run wild in the winter. Installing a new clean-burning stove typically costs $2,000 or more – and many argue that it’s lousy timing to launch an expensive campaign to clean the air, federal standards or no federal standards. 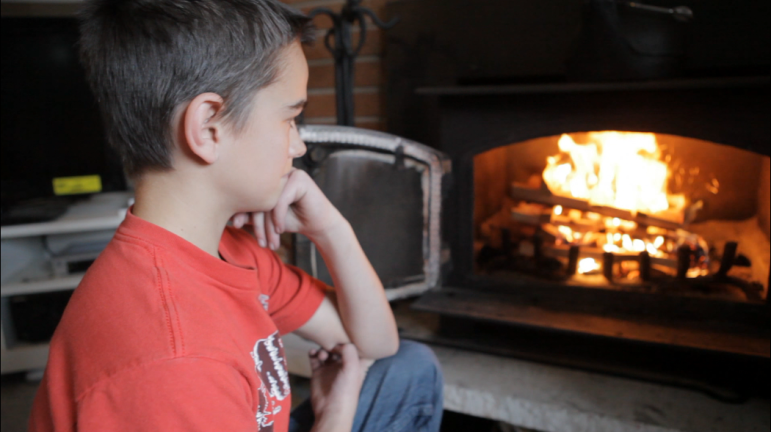 Alex Smith, 13, admires the fire he built in his family’s wood stove in Puyallup. Yet that’s the recommendation of a task force representing local governments, industry, the military and others involved with soot pollution levels in and around Tacoma. Last week the group voted to recommend removal of all wood stoves that don’t meet current government standards by 2015 in the area violating the Clean Air Act. “It scares me,” said Gretchen Smith of Puyallup, whose family spends about $380 a month on electricity, including baseboard heaters, even when they use wood heat as a supplemental heat source. The Smiths’ wood stove, manufactured before federal rules required large increases in efficiency and decreases in pollution, is one of an estimated 24,000 old, heavily polluting wood stoves spread across the area violating the federal law, which includes most of Pierce County, from near Orting to Steilacoom to Commencement Bay. Other Pacific Northwest communities, including Klamath Falls and Oakridge in Oregon, the Cache Valley of Idaho, and Libby, Montana, are also in violation of the federal Clean Air Act’s rules on soot. And Washington officials say Yakima, Darrington, Marysville, Vancouver, Wenatchee and Clarkston are at risk of violating the federal soot standards. “We have a number of communities getting up around those (violation) levels and they’re all dominated by wood stoves,” said Stu Clark, manager of Ecology’s air-pollution program. Kent, Everett, Olympia, Port Angeles, Spokane, Lynnwood, Mountlake Terrace, Lake Forest Park and south Seattle also have struggled with high soot pollution levels, much of it thought to be traceable to burning wood. The problem that Tacoma faces today from wood smoke is likely to be a growing problem across the West in years to come, said Jeff Hunt, an air pollution specialist for the EPA’s Seattle-based Region 10. Meanwhile, federal soot standards could be tightened as early as 2012, although it would still be a number of years before they were enforced. In the meantime, though, health damages mount. Picture the width of a human hair. Now imagine a speck of toxic-covered dust that is 1/30thas wide. These are the so-called “fine particulates” – soot – that knocked Tacoma into violation of the Clean Air Act. They mostly come from burning wood, diesel, gasoline and other fuels. And for susceptible people, they can kill. Exposure to these particles over a few hours to weeks can trigger heart attacks and strokes, according to an expert panel’s report for the American Heart Association in May 2010. The particles are so small that not only do they get into the lungs, causing respiratory distress, some also cross over into the bloodstream itself. Nor is wood smoke the only source of the tiny particles. They also come from truck and car exhaust, ships, dust, industry and sea salt. But in the Clean Air Act “non-attainment area” in Pierce County, 53 percent of them are estimated to come from burning wood on the winter days when the area violates the federal law. carbon monoxide, which is a poison and which has been shown to cause chest pain in people with heart disease because it reduces the amount of oxygen delivered to the body. Carbon monoxide also can cause permanent heart damage. But the effects of soot are most immediately obvious in the way they affect breathing. One study in the Tacoma area documented a significant increase in emergency-room visits when levels in the air are high. David Ricker is a lung doctor who treats children at the Mary Bridge Children’s Hospital in Tacoma, where the most common diagnosis of kids admitted is bronchialitis, constriction of the small lung airways that leaves children wheezing and in need of oxygen in the hospital for several days. Ricker says that his caseload goes up in the fall and winter, and he’s sure wood smoke contributes. On a recent day Ricker treated a two-year-old boy who had been brought into the emergency room coughing and wheezing so hard that the skin at the bottom of his throat and on his ribcage was sucked in on each breath. A tube attached to a breathing machine had to be put down his windpipe. The same boy had been to Mary Bridge in the same condition multiple times. “People’s health is truly affected,” Ricker said. “I recognize that people have to heat their homes, so sometimes switching to a cleaner source of heat is just not a practical possibility. It is pouring rain as Erik Saganic, an analyst for the Puget Sound Clean Air Agency, stands outside an unassuming shed surrounded by a collection of air-testing equipment at the edge of a playfield at a south Tacoma elementary school. He is four miles from Tacoma’s industrial waterfront. High pollution levels in this unassuming neighborhood are what threw a 200-square-mile area of Pierce County into violation of the federal Clean Air Act. Under that law, all the Northwest communities violating the soot standards are supposed to have the problem taken care of by 2014. But nobody thinks that’s going to happen in Tacoma. The Puget Sound Clean Air Agency, which regulates air pollution in Pierce, Snohomish, King and Kitsap counties, is counting on the U.S. Environmental Protection Agency to give deadline extensions until as late as 2019. That’s because of the size of the task. 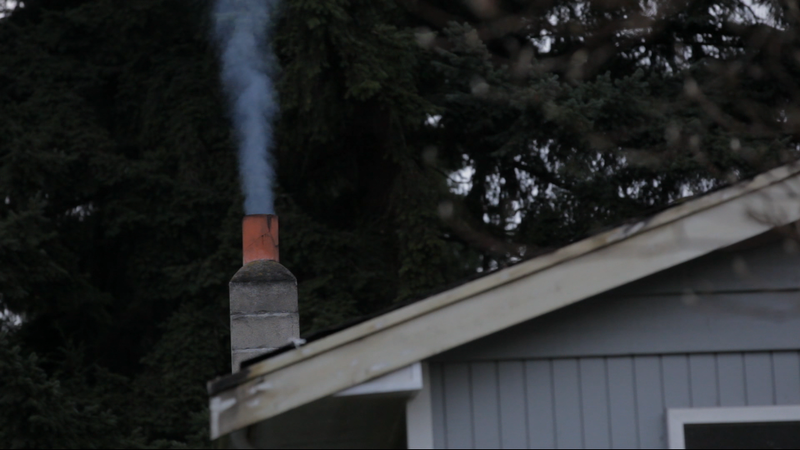 The Puget Sound agency estimates it needs to persuade or force some 15,000 of the 24,000 owners of uncertified wood stoves to remove them in order to comply with the Clean Air Act.Just to remove and patch up the walls where those 15,000 stoves now stand would cost about $7.5 million – and at least some families would need to install a new wood stove at a cost of $2,000 or more each. Newer EPA-certified stoves cut emissions signficantly. They typically cost $2,500 or more. All this needs to be done just as local and state governments find their finances at the lowest ebb in memory. Costs overall could reach into the tens of millions. To help work through options for solving the problem, the Clean Air Agency organized a task force representing local governments, industry, the military and others involved with or concerned about the soot pollution levels in and around Tacoma. Beefed-up enforcement of burn bans in the area in violation of the Clean Air Act. Among the changes envisioned: Changing the standard for a violation from a complicated system that involves estimating how opaque the smoke is to a simpler system in which any visible smoke is considered a violation. A menu of options to reduce fine-particle pollution from sources other than wood smoke, such as cars, trucks and ship. However, the task force did not recommend what some see and an obvious candidate for regulation: Fireplaces. The task force reasoned that they are not used as often as wood stoves and that most are not legally permitted to be in use when air pollution levels increase and the Puget Sound Clean Air Agency initiates a burn ban — which is when the Clean Air Act typically is violated. Those recommendations go the governing board of the Puget Sound Clean Air Agency, which must tell the state Ecology Department how it intends to reduce pollution to legal levels. Ecology has to tell the EPA by December 2012 what it will do to solve the problem. At a recent meeting the Clean Air Agency board expressed skepticism about leaving alone fireplaces that represent 20% of the problem. “The Realtors were very unhappy when we started talking about (restrictions on) fireplaces,” Kenworthy told the clean air board. And in fact, state law regulating burning solid fuel for heat exempts fireplaces. Clean air regulators face other challenges in the way the law is written, too. Legally, a person may continue to burn wood for heat – even during a burn ban – even if he has other heat sources such as electric-powered baseboard heat if those other devices can’t raise the temperature to 70 degrees. One man who showed up at a Clean Air Agency open house threatened to remove his electric heat so that he could legally continue to burn wood. “This is the same individual who asked … Is your SWAT team going to come with their assault rifles to tear out my stove?” Kenworthy said. Mindful of the potential for a public backlash, officials are treading gingerly. For example, they promise that whatever system ultimately is set up, it will have features designed to help poor people who cannot afford to replace their stoves. “That’s a given,” Kenworthy said. But details remain to be worked out. Over the last four years, the Clean Air Agency, Tacoma, Pierce County and the Ecology Department have already given out $3.4 million to help. Most of that went to remove and recycle 1,217 wood stoves and devices known as fireplace inserts that also are part of the problem. The state may be able to provide another $500,000, said Ecology’s Clark. But what happens after that? Officials say the whole tab in Tacoma could run $50 million or more. New ideas for enforcing burn bans also are surfacing. For example, officials know that much more wood stove use occurs at night, when people are home and temperatures are coldest. However, in the dark it’s difficult if not impossible to determine how much thick smoke is coming out of a chimney. One potential way around that is the use of infrared vision devices. Make it easier to issue a notice of a burn ban. Currently state law instructs clean-air agencies to call a burn ban only when forecasts predict air will violate the soot standard. “If you wait until you’re going to violate the standard, you really haven’t helped yourself,” said Ecology’s Clark. The agency wants a less restrictive standard for when burn bans can be issued. Expanding the inspection force. The number of inspectors at the Puget Sound Clean Air Agency varies from eight to 12, and they work in pairs. That’s two to three inspectors per county. Ecology is exploring whether Health Department officials could help out. The same goes for city building code inspectors, whose workload drops in the winter along with the amount of construction. Defining what the law means when it says local governments can “prohibit” use of old, dirty stoves if their area violates the Clean Air Act. Better defining what state law means when it says that wood burned in stoves has to be “seasoned,” or dried. Realtors and other helped shoot down legislation earlier this year that would have required a new, clean-burning wood stove to be swapped for old polluting models when a home is sold. It was “a 30-year strategy and we have to solve this problem in the near term,” Clark said. A long-term strategy is going to be needed across the West and even across the globe, said University of Washington air-pollution researcher Michael Yost, who has tracked wood-smoke levels in Tacoma and Seattle. “We have a fuel that we can use which is relatively eco-friendly. It’s a renewable resource,” Yost said. “So there’s a natural advantage to that biofuel use, but biofuels by and large across the world are much dirtier and have higher emissions. This story is part of an ongoing collaboration between InvestigateWest, an independent nonprofit newsroom covering the Pacific Northwest, EarthFix/KCTS 9, a public broadcast project on the environment, and Northwest News Network, a consortium of public radio stations in the Northwest to look at regional air pollution. Please consider a donation to support this kind of in-depth reporting.